MASSIVE Broad Street Property for Sale! 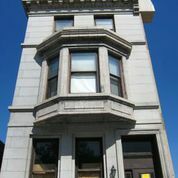 Gorgeous 5500 + square foot Broad street property that runs street to street with parking. Detached, free standing building! Limestone and Granite facade! One block from the hospital, next to Starbucks and commercial Broad street strip center at Broad and Jackson. HOT Location with Huge rent potential!! Roof Deck views of Center City and South Philly, and Stadiums. It’s fully approved and permitted for 6 residential rental units and 2 parking spots (but you can probably fit 4 prkg total). 4–1 bed/1 bath, 1–2 bed/2 bath, 1–2 bed/1 bath. The property is framed and new plumbing is almost completed, fully permitted….. easy to rent due to hospital located down block and booming navy yard expansion. Broad Street Subway entrance ½ block away! The owner has other projects he wants to move to and wants to sell. He is asking 725k. It needs another $200k or so to finish but should cash flow very nicely. Truly an amazing building and rare opportunity! Plans and multi-tab pro-forma attached..
CLICK HERE FOR BUILDING PERMITS! CLICK HERE FOR 1st & 2nd FL PLANS! CLICK HERE FOR 3rd & 4th FL PLANS! ← New rehab deals NOT ON THE MLS! !